4-Word Review: Bank robbery goes bad. Based on pulp writer Jim Thompson’s novel the story centers on Doc McCoy (Steve McQueen) who is stuck in the Texas State Prison and itching to get out. 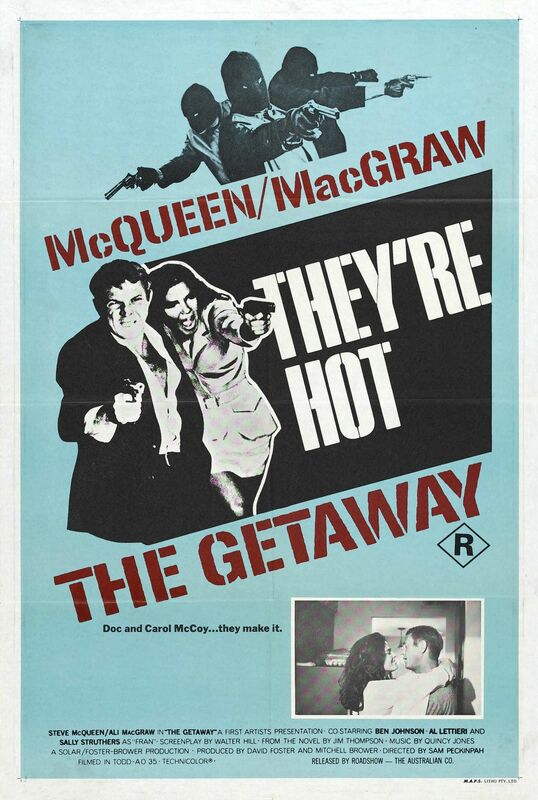 He gets his wife Carol (Ali MacGraw) who is on the outside to strike a deal with Sheriff Jack Benyon (Ben Johnson) where he will get a release as long as he agrees to rob a bank using Benyon’s men. Doc is somewhat reluctant, but agrees to go along with it only to find that after the robbery he has been double-crossed and now along with his wife must make a dash for Mexico while being chased by the cops and going through a wide assortment of unexpected obstacles. Action director guru Sam Peckinpah has done many classic films most notably The Wild Bunch and Straw Dogs, but this one has always been my favorite as it’s a nice mix of action, character study and comedy. In fact it’s the subtle humor that I like best. I get a kick out of the shot showing Benyon’s brother’s henchman riding in a convertible down a highway while having their hands on their cowboy hats in order to keep them from blowing off. I also chuckled at the book actor Dub Taylor has in his back pocket while cowering under a table during a shootout or what actor Al Lettieri immediately does after finding a dead man hanging in a bathroom. Peckinpah also makes great use of sound particularly at the beginning where during the opening credits we hear no music, but instead the monotonous sounds of the machines inside the prison workshop, which helps convey Doc’s increasing frustration and this sound doesn’t stop until the exact second that the prison doors open up and allows him out. When there is music it’s effective and distinct particularly the harmonica solos by Toots Thielemans. Of course Peckinpah’s trademark action sequences are excellent and maybe even superior to his other films because the situations are more unique including an exciting segment showing the couple trapped inside a garbage truck as well as an impromptu shootout along the main street of Fabens, Texas. The only complaint is the scene where Doc’s car goes crashing through someone’s front porch and yet the car shows no visible damage; one shot does show a crack in the corner of the windshield, but then in the next shot it has magically disappeared. McQueen’s ability to show effortless cool and make an edgy character likable proves what a legendary actor he is and it’s a shame that he doesn’t get placed with the best of them amongst casual movie fans because he really should. MacGraw is at the peak of her beauty here and her moments of vulnerability are great. Struthers gives the best performance of her career as an unfaithful wife of a kindly veterinarian (Jack Dodson) and Lettieri, who unfortunately died at the young age of 47 just 3 years after this film’s release by a heart attack brought on by severe alcoholism, which was already painfully apparent to the cast and crew during the filming of this adds great tension as Doc’s double-crossing partner. The film also makes great use of its Texas locations bringing out the ruggedness of the region without overdoing it. I particularly liked the scenes in the junkyard as well as footage shot on-location inside the Huntsville prison using actual prisoners and the longshot showing the flat, barren landscape that Doc first sees when he gets out. I’ve watched this movie many times and never cease to grow tired of it. In fact it seems even more original after multiple viewings. It was unwisely remade in 1994 that starred Alec Baldwin, who doesn’t come close to McQueen’s stature. This version is by far the better one and the other should be avoided. 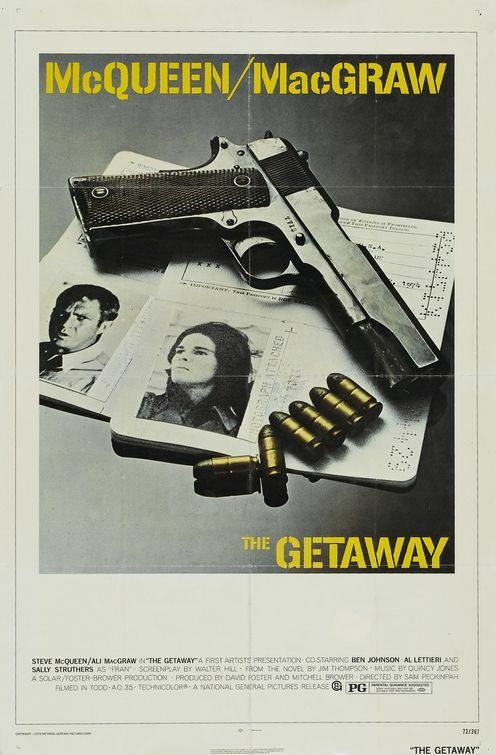 This entry was posted in 70's Movies, Action/Adventure, Black Comedy, Fast Cars/Car Chase, Movies Based on Novels, Movies that take place in Texas, Robbing Banks and tagged Al Lettieri, Ali MacGraw, Entertainment, Movies, Review, Sally Struthers, Sam Peckinpah, Steve McQueen. Bookmark the permalink. I agree with the review, but I found the remake to be quite decent. While not a fan of Alec Baldwin, I thought he handled the role quite well considering the large shoes he had to fill. Maybe I sounded overly harsh. I agree it’s okay, butI guess my disdain for the remake is simply because I didn’t think it was necessary and tarnishes the mystique of this one a bit. I see. On another topic I would like to see you review the 1970’s Walter Matthau films Charley Varrick, The Laughing Policeman and The Taking of Pelham 123. I’ve already reviewed ‘Charley Varrick’ you can get to it via the 70’s tab. I haven’t seen ‘The Laughing Policeman’ in years, but it will be worth a look again simply to see Matthau in a rare serious, tough guy role. ‘The Taking of Pelham 1-2-3’ I have seen several times and enjoy, but I will try to get to again sometime in the near future. I think we can again agree hopefully that the original is far better than the Washington/Travolta remake. Lowbrow entertainment with 2 stars slumming and Peckinpah marking time. It seems to enjoying heaping degradation on everyone! I guess that could be called rough minded. A good B movie at an A list price.